Last week, while writing about the latest IRS scandal, I noted that the IRS has a long record of abusive actions. So I wasn’t surprised to learn that it also has politically biased employees. But some Americans probably are shocked. So I want to be the first to publicly thank President Obama for – at the very least – presiding over a culture that gave IRS bureaucrats the green light to engage in this kind of misbehavior. Why am I thanking Obama? 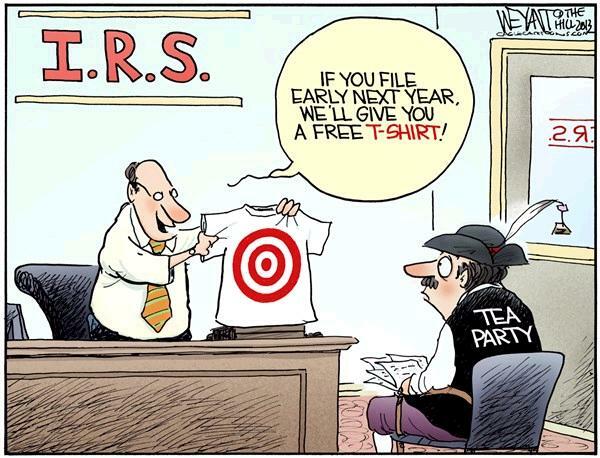 For the simple reason that this scandal means that more Americans now understand that the IRS is a venal agency. And that presumably means that more Americans now realize we should junk the internal revenue code and implement a simple and fair flat tax. Since I’m in an expansive and sharing mood, I think we also owe some appreciation to some of the good people who are helping to publicize the IRS’s despicable behavior. Let’s start with George Will, who is predictably – and bitingly – critical. …the nature of Barack Obama’s administration is being clarified as revelations about IRS targeting of conservative groups merge with myriad Benghazi mendacities. …we are told that a few wayward souls in Cincinnati, with nary a trace of political purpose, targeted for harassment political groups with “tea party” and “patriot” in their titles. …Jay Carney, whose unenviable job is not to explain but to explain away what his employers say, calls the IRS’s behavior “inappropriate.” No, using the salad fork for the entree is inappropriate. Using the Internal Revenue Service for political purposes is a criminal offense. I also like that Will took the opportunity to criticize the worst (or at least close-to-worst) President in American history. Time was, progressives like the president 100 years ago, Woodrow Wilson, had the virtue of candor: He explicitly rejected the Founders’ fears of government. Modern enlightenment, he said, made it safe to concentrate power in Washington, and especially in disinterested executive-branch agencies run by autonomous, high-minded experts. Today, however, progressivism’s insinuation is that Americans must be minutely regulated because they are so dimwitted they will swallow nonsense. 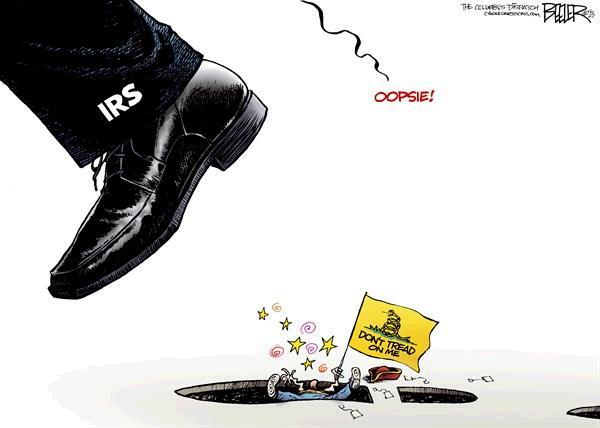 Such as: There was no political motive in the IRS targeting political conservatives. How painfully true. Sheep are not famous for their intelligence. And as the American people learn to be passively dependent on government, presumably we will acquire more sheep-like characteristics. But the firestorm of protest leads me to think we’re not at that stage. At least not yet. The lawless and abusive IRS even got Michael Gerson agitated. …most Americans, myself included, become libertarians when a policeman is rude and swaggering during a traffic stop. Give me that badge number. It is precisely because police powers are essential to the public good that abusing them is so offensive. The same holds for overzealous or corrupt airport-security agents. And it is doubly true with IRS personnel who misuse their broad and intimidating powers. It is enough to bring out the Samuel Adams in anyone. And here’s what my colleague Gene Healy wrote about the IRS’s history of political shenanigans. Let’s close with a couple of good cartoons. The first one reminds me of the joke that “Service” is part of the IRS’s name, but only in the way that a bull services a cow. The humor is a bit darker in this cartoon, but the message is the same. P.S. Since I’m in such a good mood, I’ll share some of my other IRS humor, including a new Obama 1040 form, a death tax cartoon, a list of tax day tips from David Letterman, a cartoon of how GPS would work if operated by the IRS, an IRS-designed pencil sharpener, two Obamacare/IRS cartoons (here and here), a sale on 1040-form toilet paper (a real product), a song about the tax agency, the IRS’s version of the quadratic formula, and (my favorite) a joke about a Rabbi and an IRS agent. The other (and I think the main) reason that this issue has suddenly come to the attention of the press is that they figure it is less damaging to their favorite president than the alternative- the Bengazi nightmare. Please iognore that stuff going on with my left hand- watch my right hand.